It’s been a long time since I last held a giveaway. Don’t worry, they’re coming! Let’s start with another one from one of my favorites, SheInside.com. This contest is open to everyone! Both foreign and local readers are eligible to join. Deadline for entries is on August 12, 2012 at 11:59PM. No multiple entries please. As usual, winner will be chosen via Random.org and announced through my Twitter. Good luck everyone! Im hoping to win this time ^^ I <3 your giveaways. Hi Camillie Co! you are so pretty and cool! Hi Camille! Love your style. Simple yet chic! I did all of the above!! I also follow you on Bloglovin’. I love your giveaways and your blog! 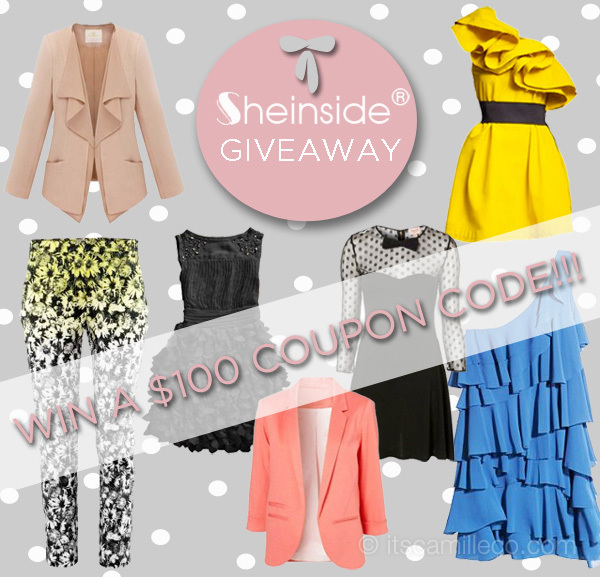 I would be so happy if I won cause I love Sheinside! please discard the first one i posted it with incomplete details by mistake..thank you. Thank you for this giveaway, Camille! I’m not a lucky girl but I’m joining anyway. fingers crossed! So cute ! :) fingers crossed ! Honestly, I super like the tops,dresses and accessories in sheinside.com. It’s quite affordable and has a unique style. :) So, I hope I’ll win. I want to shop at sheinside.com for free.